Royal and Ann depart from my house for points west. My wife and I recently played hosts to "Royal," creator of the Royal Enfield Interceptor Owners website and his wife Ann at our home in Fort Lauderdale, Fla. 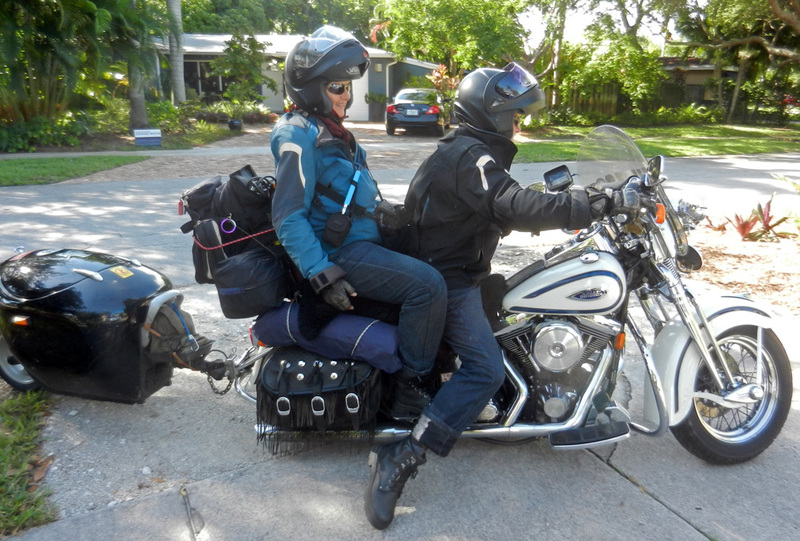 These intrepid, Swedish born Australians were on their way to Key West, the tail end of the chain of keys (islands) that carries you as far south as you can be and still be in the southeastern United States. Royal and Ann already had motorcycled through more of the U.S. then I've ever seen — including Alaska — and in only three months' time. They just generally charmed us with their can-do attitude. Although Ann is riding in back this trip, she is a motorcyclist. She built her own Royal Enfield Interceptor, using bits from a Series I and a Series II. Royal is also the moderator of the popular Royal Enfield Interceptor Owners Group on Yahoo. Of course the Royal and Ann weren't riding Royal Enfield Interceptors when they got to my house — it's not what those greyhounds are for. They're doing this trip aboard "Louise," their beloved Harley Davidson, shipped from Australia. They're towing a trailer and doing some camping. Louise got a new tire for the trailer's single wheel while in my garage. Royal showed me how to break the bead by gently letting the Harley's kickstand down on the tire. Royal and Ann's Facebook page details a journey that began in California June 4, and reached my home more than 15,000 miles later on Aug. 17, 2015. By that time their mileage chart list included: California, Oregon, Washington, British Columbia, Alaska, Yukon Territory, Alberta, Idaho, Montana, Wyoming, South Dakota, Iowa, Illinois, Wisconsin, Michigan, Ohio, Pennsylvania, New York, Ontario, Massachusetts, Vermont, New Hampshire, Rhode Island, Connecticut, New Jersey, Delaware, North Carolina, Tennessee, Georgia, Alabama, Mississippi, South Carolina and Florida. They went all the way to the Arctic Circle in Alaska, saw Mount Rushmore, Wounded Knee, Niagara Falls, the Statue of Liberty, the U.S. Capitol, the Jack Daniel's Distillery, the Musician's Hall of Fame in Nashville, the Dragon's Tail and Stone Mountain and much more. Louise and her riders climbed Mount Washington! They visited the Harley Davidson museum in Milwaukee, the Wheels Through Time Museum in Maggie Valley and the Barber Vintage motorcycle museum. Movie fans, they talked so much about Punxsutawney, Pa. ("Groundhog Day") that I began to suspect they might have been there more than once. As they rolled out of my garage, Royal eyed the discarded trailer tire. "I hope you won't have to pay a disposal fee for that," he said. "Oh no," replied my wife Bonnie. "I plan to use it as a planter in the garden."